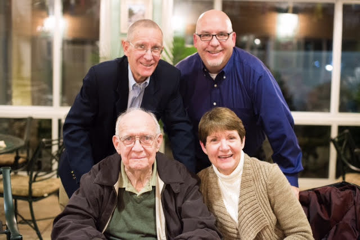 Trustees: Charlie Brown, Rob Brown, Keith Brown Dubois, pictured with founding trustee, Dr. Charles S. Brown. Through the continued generosity of the Charles S. & Millicent P. Brown Family Foundation, the Stratton Foundation offers a Personalized Learning Plan (PLP) Scholarship opportunity as a powerful engine to facilitate the mindset shift out of poverty. Through an application process at-risk teens create a Plan, mapping a new vision for the future and steps necessary to reach a desired goal, such as completing an internship, a college course, or a special training event; things that go beyond their family’s financial reach or seen as an insurmountable obstacle, but critical in turning vision into action. Through these experiences, teens in Burr & Burton Academy’s Success Program will realize they can overcome challenges, rise above poverty, value education and themselves as their greatest asset, and be empowered to succeed. To apply, Success Scholars should contact Mr. Jason Pergament. Since 2014, Mr. Todd Richter has generously gifted first-generation scholarships to local seniors from Leland & Gray High School and Burr & Burton Academy, who are the first in their family to attend college. In fact, our local high schools still witness seniors who are the first in their family to graduate high school, often needing to work to contribute to the family’s economic situation or without encouragement and resources to realize their full potential. Through an application process, teens who recognize the value of further education as life-changing and demonstrate financial need are considered. To apply, contact your school college counselor.